Perhaps one of our favorite cities in the world, the San Francisco convention center hosts nearly 120 different types of trade show events and fairs on an annual basis, from traditional to modern exhibitors, we want to ensure that all of our customers can find the perfect trade show display, event backdrop, and portable trade show booth to cure their exhibition needs! Where is the San Francisco Convention Center Located? The Moscone Center is located at 747 Howard St, San Francisco, CA 94103. The Moscone Center is the largest convention center in San Francisco, and home of the largest and most electric trade shows, predominantly in the tech sector but not limited in any way as Vape trade shows and other rising markets continue to thrive. What types of products are suggested in SF? The San Francisco trade show market is robust and dynamic, making a particular range of the products listed above a perfect fit. 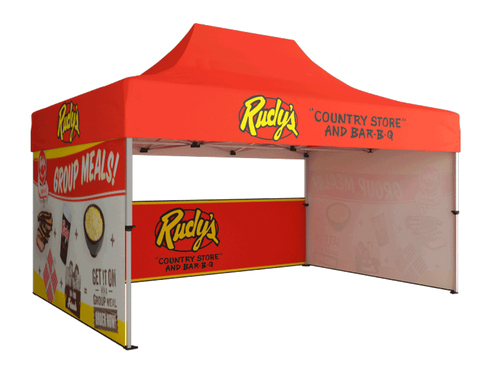 Choose from our tru-fit trade show displays, perfect pop fabric booths, or Max package displays to create the perfect trade show display solution. What can I do to stand-out in San Francisco? With the tech sector thriving in Silicon Valley, we strongly advise adding digital mediums like monitor mounts and video displays, like the tru-fit max package or ipad displays to ensure you are getting the proper visibility on the trade show floor! Content is king, so prepare to demonstrate vibrant videos and media to allow your brand to shine!